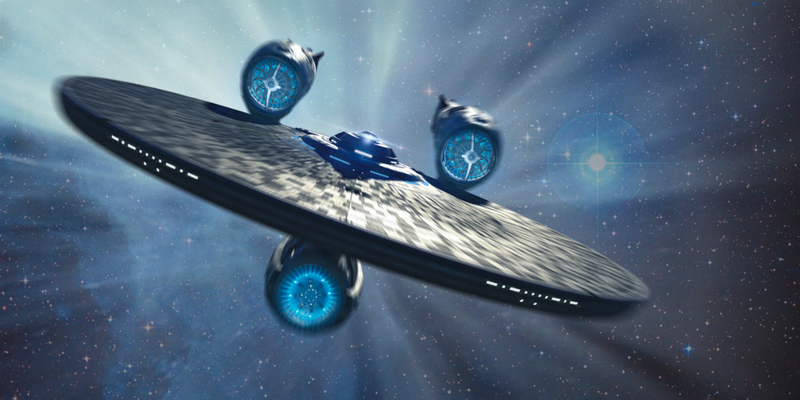 STAR TREK BEYOND OPENS IN THE US ON THE 22nd OF JULY AND IN MALAYSIA ON THE 21st OF JULY. TO FIND OUT WHEN IT OPENS NEAR YOU CLICK HERE. The USS Enterprise gets trashed again and rebuilt again at the end! 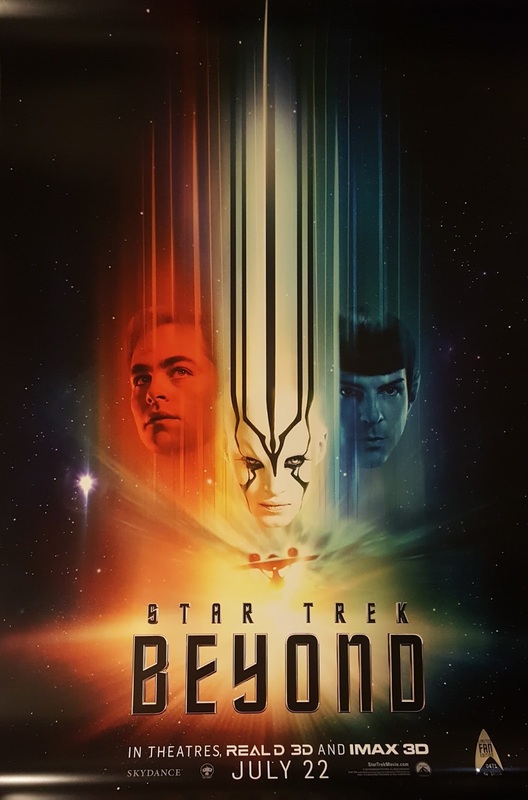 So after Star Trek Into Darkness (2013) which I thought was pretty good but made better because of Benedict Cumberbatch's performance as Khan comes Star Trek Beyond which takes the intrepid crew of the USS Enterprise even further out into the unknown frontiers of space, exploring new worlds and acting as ambassadors for the United Federation of Planets. And like the opening of the previous installment Kirk (Chris Pine) screws things up. Anyway, after the screw up the crew return to the Federation's new outpost to resupply but on their way pick up a distress signal which leads them to a ship. They save the ship and it's single occupant an alien named Kalara (Lydia Wilson) and bring her back with them to Yorktown. They figure out what she's talking there and soon after completing the resupply they crew of the Enterprise shoot off to the nebula that Kalara says her crew were left behind. Of course this being the Enterprise it doesn't turn out to be a simple rescue mission. They are ambushed and the Enterprise ends up crashing on the M-class planet below scattering whatever survivors that aren't captured all over the planet's surface. 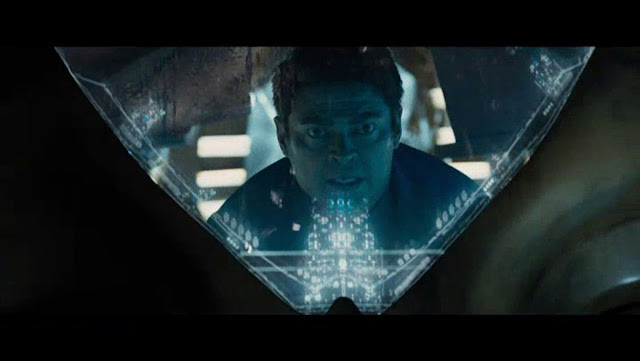 So what follows after that is that Kirk's escape pod manages to land quite near to Chekov's (Anton Yelchin) pod so they team up to search for the others, Spock (Zachary Quinto) and Bones (Karl Urban) hobble their way in search of the others as well after Bones extracts a huge piece of the alien space ship they escaped in out of Spock's side and Scotty, who escaped in what appears to be a torpedo meets a feisty female alien named Jaylah (Sofia Boutella) who strikes up a deal with him. 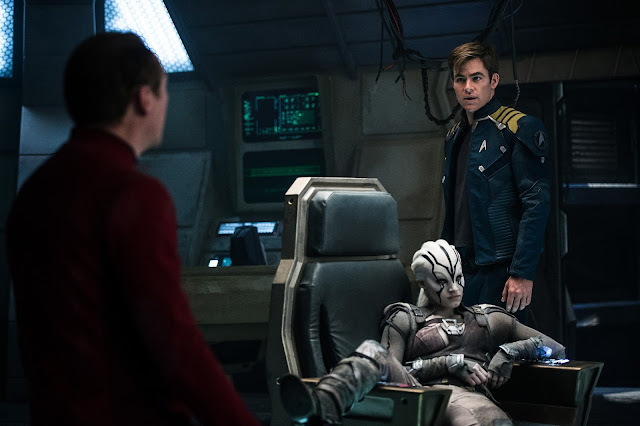 Meanwhile, Sulu (John Cho) and Uhura (Zoe Saldana) who were captured try to figure out what's going on by wandering around the enemy's hideout after Keenser (Deep Roy) the little alien assistant to Scotty sneezes acid snot on their prison's lock. The big bad baddie in this Star Trek is named Krall (Idris Elba) who is assisted by Manas (Joe Taslim) and a whole army of cool looking soldiers. Krall has a huge grudge against the Federation and as with anyone with a grudge against the Federation wants to destroy it and kill anyone associated with it. So here's what I liked about it. The story. The version that finally makes it to the big screen was written by Simon Pegg and Doug Jung. The story is tight, funny and action packed. The directing. Directed by Justin Lin who directed several movies in The Fast and The Furious franchise certainly knows his way around an action movie and I'm guessing with a lot of help from Pegg and producer J.J. Abrams managed to give trekkies and non-trekkies a fun and entertaining movie that satisfies without requiring too much knowledge about the franchise. The action. Which starts off with a bang and is paced and peppered quite nicely throughout. The cast. After two movies they really know how to play off each other. Though I don't know why I'm still not entirely convinced by Urban's portrayal of Bones. Idris Elba. His Krall is completely believable. It was impossible to recognise Elba. As is Boutella's Jaylah. The humor. Funny little one liners sprinkled throughout stop this movie from becoming too serious and dark. The music which even for us is from way back and by the folks on the Enterprise considered classics. Krall's character isn't given much depth. I would have liked to have learnt more about him and had the story focus a bit more about him. Jaylah's character too could have been given more meat or more screen time or something. There were a few weaknesses here and there in terms of the plot, the tech, sequence of events, etc. but luckily they don't interfere with the story much but I guess that's just me. Overall it's a really fun movie to watch and a good follow up to 2013's Into the Darkness, it's a nice way to say goodbye to Anthon Yelchin and Leonard Nimoy both of whom passed away prior to the release of the film. I'm guessing it'll please both fans of the franchise and those who are just casual ones. 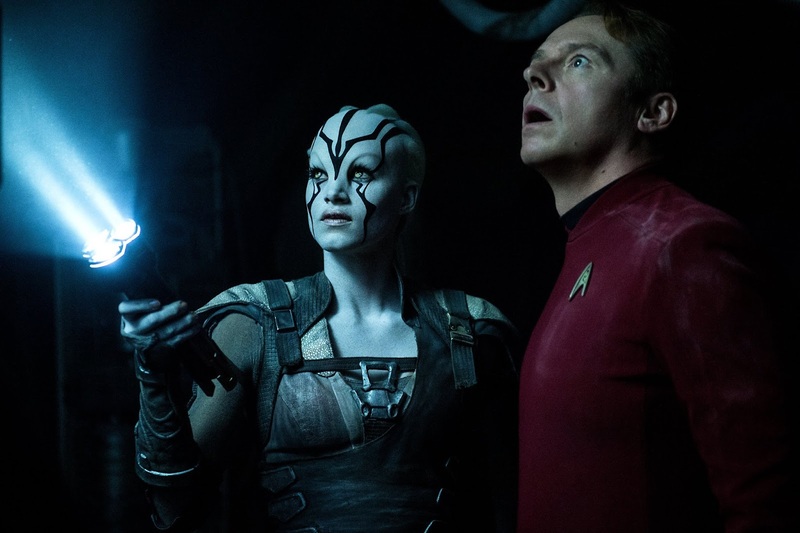 If you've got nothing better to do Star Trek Beyond is well worth watching this weekend. A worthy follow up. Oh and if you heard about that mess about Sulu being gay, it makes absolutely no difference to the character. Have a look at the latest trailer below.